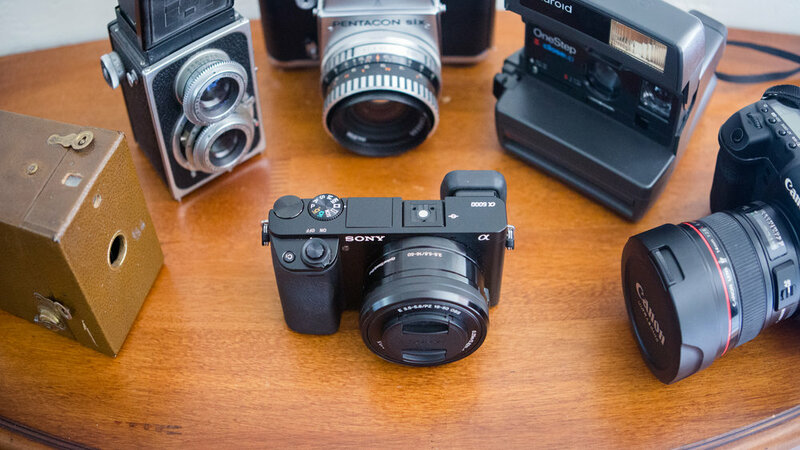 Mirrorless cameras are the latest trend in digital photography. As size reduction in technology continues, powerful digital cameras are able to come in smaller packages, making this the ideal time for the mirrorless models. Mirrorless cameras have established themselves as a staple in the digital market for the past ten years. Their performance and price point makes them a worthy competitor for their DSLR counterparts, while providing a more travel-friendly option for photographers on the move. The lack of an internal mirror, as the name would suggest, allows for the mirrorless camera body to be quite compact and lightweight. Depending on the lens that is attached, you could easily fit a mirrorless camera in your pocket – a feat unheard-of for a DSLR owner. With a hint of nostalgia, in a conveniently sized form, these powerful cameras are becoming the go-to consumer models for the next generation. The Sony a6000 is a handy, mirrorless camera perfect for those learning digital photography or for the intermediate photographer wanting to add a compact camera to their collection. It accepts a variety of interchangeable lenses so you can appropriately cover any event, and it performs well in low-light situations with an ISO range up to 25,600. The battery life is decent but not as prolonged as a DSLR, since the screen of the mirrorless camera is in constant use while photographing. The strap that comes with the camera body feels cheaply made, and the SD card slot is in an awkward location, but other than those minor aspects, this reasonably priced camera would make a great addition to your set. At first glance, the a6000 has a similar appearance to an old 35mm film camera (for those of us that remember using film) but look to the back of the camera for an indication of its capabilities. The a6000’s tilt-able 3” LCD display screen contains a wealth of menus for selecting your preferred photo style, white-balance, or focal points. There are a stunning 179 focal points to choose from, along with built-in face detection, and a rapid-fire 11fps (frames per second) burst mode so you never walk away having missed the shot. There are a few ergonomically placed buttons to the right of the LCD screen, for quick adjustments while shooting, such as pulling down your ISO or setting up exposure compensation. The placement of these buttons on the compact body allows for quick, one-handed photography maneuvers, benefiting those photographers with smaller hands. The Sony a6000, while small in size and very lightweight, still feels solidly built and provides many user-friendly options. The tilt screen, for example, allows the photographer to shoot “from the hip” or other heights while still remaining aware of their composition. If you need to photograph over a crowd, just hold the camera high above your head and tilt the screen down to be sure you create the image you want, rather than guessing and hoping for the best. The tiny build of a mirrorless camera doesn’t indicate a loss of image quality, as they house the same robust sensors (24+megapixel) as the larger DSLRs. Higher end mirrorless Sony models like the a7II and a7III offer a full frame sensor, but the more budget friendly a6000 boasts a 24.3megapixel, APS-C cropped sensor (1.5x crop factor), which is capable of capturing high-quality images up to 6,000 x 4,000 pixels and 1080i/p video. Competitor DSLR cameras with an APS-C cropped sensor are typically twice the cost of the a6000. The a6000 kit lens is an introductory level 16-50mm f/3.5-5.6 lens, which on a cropped sensor translates to a tighter ~24-75mm lens. Again, the kit lens is great for a beginner, but those more skilled in photography or photographing in difficult lighting situations may want to invest in other e-mount compatible lenses. The ability to switch lenses is one of the best features when deciding on your next camera body. It makes your camera adaptable to any situation. Keep the cropped sensor of the a6000 in mind when shopping for a second lens, as it will alter your field of vision, essentially “zooming in” on your subject matter when compared to the same lens with a full-frame sensor. The APS-C cropped sensor will have a 1.5x crop factor so a 24mm lens will actually perform like a 35mm lens. This can be a benefit for those photographing sporting events or wildlife with a zoom lens. The crop factor will increase your zoom by capturing an even tighter image. The Sony a6000 is the ideal digital camera for the budget-conscious traveler that is comfortable shooting in manual mode or ready to explore the world of video. The camera may lack a few of the bells and whistles found on higher-end models (like a microphone jack or second memory card slot), but it is capable of delivering great footage in a very convenient form.